1. Promotion Description: The ‘Stance For Summer Giveaway’ (“Sweepstakes”) lasts seven days and begins on May 13, 2015 at 12:00:01 AM (Pacific Time (US & Canada)) and ends on May 18, 2014 at 11:59:59 PM (Pacific Time (US & Canada)) (the “Promotion Period”). By participating in the Sweepstakes, each entrant unconditionally accepts and agrees to comply with and abide by these Official Rules and the decisions of Consider Media LLC (Consider Collective) (“Sponsor”), which shall be final and binding in all respects. Sponsor is responsible for the collection, submission or processing of Entries and the overall administration of the giveaway. Entrants should look solely to Sponsor with any questions, comments or problems related to the Sweepstakes. 2. Eligibility: Open worldwide to those who are 13 years or older. Void where prohibited or restricted by law. Sponsor and their respective parents, subsidiaries, affiliates, distributors, retailers, sales representatives, advertising and promotion agencies and each of their respective officers, directors and employees (collectively, the “Promotion Entities”), and members of their immediate families and/or persons living in the same household as such persons, are ineligible to enter the Sweepstakes or win a prize. 3. Winner Selection: The winner of the Sweepstakes will be selected in a random drawing from among all eligible Entries received throughout the Promotion Period. The random drawing will be conducted within 1 hour by Sponsor or its designated representatives, whose decisions are final. Odds of winning will vary depending on the number of eligible Entries received. Winner will be notified by a Facebook/Twitter/Instagram message about 2 hours after the random drawing. Potential winner must accept a prize by email as directed by Sponsor within 48 hours of notification. Any winner notification not responded to or returned as undeliverable may result in prize forfeiture. The potential prize winner may be required to sign and return an affidavit of eligibility and release of liability, and a Publicity Release (collectively “the Prize Claim Documents”). No substitution or transfer of a prize is permitted except by Sponsor. 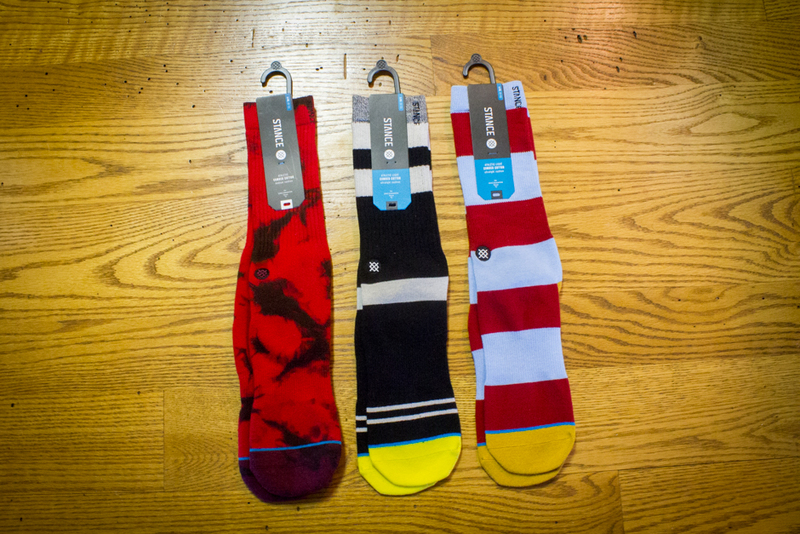 Color choice of shirt and boardshorts is dependent upon size/availability deemed by Stance Socks (“Manufacturer”). – One (1) winner will receive one (1) pair of Stance “Armstrong” Socks – approximate retail value or “ARV”: $10; one (1) pair of Stance “Burnout” Socks – approximate retail value or “ARV”: $10; and one (1) pair of Stance “Pushpop” Socks – approximate retail value or “ARV”: $10. Total giveaway approximate retail value or “ARV”: $30. 5. Automated or robotic Entries submitted by individuals or organizations will be disqualified. Internet entry must be made by the entrant. Any attempt by an entrant to obtain more than the stated number of Entries by using multiple/different email addresses, identities, registrations, logins or any other methods, including, but not limited to, commercial contest/sweepstakes subscription notification and/or entering services, will void that entrant’s Entries and that entrant may be disqualified. Final eligibility for the award of any prize is subject to eligibility verification as set forth below. All Entries must be posted by the end of the Promotion Period in order to participate. Sponsor’s database clock will be the official time keeper for this Sweepstakes. 8. Winner’s List: To obtain a copy of any legally required winners list or a copy of the Official Rules, send the applicable request and a self-addresses, stamped envelope to Consider Media LLC (Consider Collective) cc: Stance For Summer Giveaway at 3133 Turner Branch Rd, Vinton VA 24179. Request must be received no later than 6 months for the name of the winner and, by the end of the promotion, for a copy of the rules.